Our applications rely more and more on external packages to enable quick deployment and ease of development. While these packages help reduce the code we have to write ourselves, it still may present risk to our application. Each package we may use may also rely on other packages. This creates a fairly complex dependency graph of code used within your application you have no part in writing. It can be fairly difficult to identify issues related to these packages, never mind their sub packages. We all can’t run our own static analysis on each package we use, so identifying new vulnerabilities is not very easy. 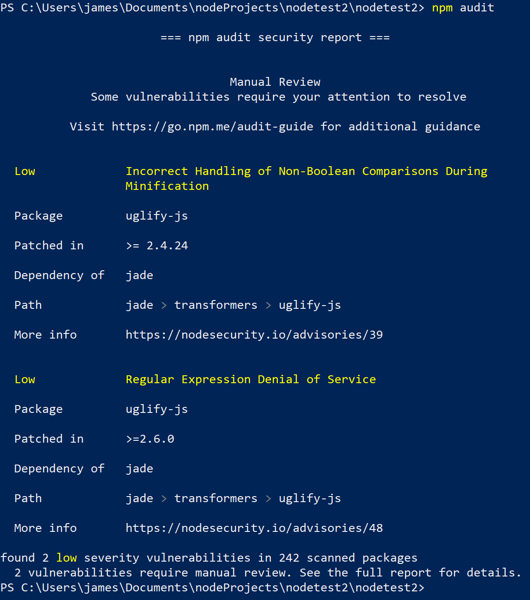 However, there are many tools that work to help identify known vulnerabilities in these packages. When a vulnerability is publicly disclosed it receives an identifier (CVE). The vulnerability is tracked at https://cve.mitre.org/ and you can search these to identify what packages have known vulnerabilities. Manually searching all of your components doesn’t seem like the best approach. Fortunately, npm actually has a module for doing just this. It is npm-audit. The package was included starting with npm 6.0. If you are using an earlier version of npm, you will not find it. As you can see, it produces a report of any packages that may have known vulnerabilities. It also includes a few details about what that issue is. The full details of the different parameters can be found on the npm-audit page at https://docs.npmjs.com/cli/audit. If you are doing node development or looking to automate identifying these types of issues, npm-audit may be worth a look. The more we can automate the better. Having something simple like this to quickly identify issues is invaluable. Remember, just because a component may be flagged as having a vulnerability, it doesn’t mean you are using that code or that your app is guaranteed vulnerable. Take the effort to determine the risk level for your application and organization. Of course, we should strive to be on the latest versions to avoid vulnerabilities, but we know reality diverts from what we wish for. Have you been using npm-audit? Let me know. I am interested in your stories of success or failure to learn how others implement these things. In the instance above, we have successfully inserted the onclick event by breaking out of the HREF attribute. The bold section identifies the malicious string we added. When this link is clicked it will prompt an alert box with the number 10. When the user clicks on the link, the alert will trigger and display on the page. We have successfully bypassed the XSS protection initially put in place. There are a few steps we can take to mitigate this issue. Each has its pros and many can be used in conjunction with each other. Pick the options that work best for your environment. Implement Content Security Policy (CSP) – CSP can help limit the ability for inline scripts to be executed. In this case, it is an inline script so something as simple as ‘Content-Security-Policy:default-src ‘self’ could be sufficient. Of course, implementing CSP requires research and great care to get it right for your application. Validate the URL – It is a good idea to validate that the URL used is well formed and pointing to a relative path. If the system is unable to parse the URL then it should not be used and a default back URL can be substituted. URL White Listing – Creating a white list of valid URLs for the back link can be effective at limiting what input is used by the end user. This can cut down on the values that are actually returned blocking any malicious scripts. When developing applications, make sure you take this use case into consideration if you are taking URLs from user supplied input and setting that in an anchor tag or IFrame SRC. For those performing static analysis or code review, look for areas where the HREF or SRC attributes are set with untrusted data and make sure proper encoding has been applied. This is less of a concern if the base path of the URL has been hard-coded and the untrusted input only makes up parameters of the URL. These should still be properly encoded. One of the often overlooked features of ASP.Net applications was request validation. If you are a .Net web developer, you have probably seen this before. I have certainly covered it on multiple occasions on this site. The main goal: help reduce XSS type input from being supplied by the user. .Net Core has opted to not bring this feature along and has dropped it with no hope in sight. In addition, there have been identified bypasses for request validation over the years. For example, using unicode-wide characters and then storing the data ASCII format could allow bypassing the validation. Input validation is only a part of the solution for cross-site scripting. The ultimate end-state is the use of output encoding of the data sent back to the browser. Why? Not all data is guaranteed to go through our expected inputs. Remember, we don’t trust the database. Some have argued that the feature did more harm than good. It created a false sense of security compared to what it could do. While I don’t completely agree with that, I have seen those examples. I have seen developers assume they were protected just because request validation was enabled. Unfortunately, this is a bad assumption based on a mis-understanding of the feature. The truth is that it is not a feature meant to stop all cross-site scripting. The goal was to create a way to provide some default input validation for a specific vulnerability. Maybe it was mis-understood. Maybe it was a great idea with impossible implementation. In either case, it was a small piece of the puzzle. So moving forward with Core, request validation is out of the picture. There is nothing we can do about that from a framework perspective. Maybe we don’t have to. There may be people that create this same functionality in 3rd party packages. That may work, it may not. Now is our opportunity to make sure we understand the flaws and proper protection mechanisms. When it comes to Cross-site scripting, there are a lot of techniques we can use to reduce the risk. Obviously I rely on output encoding as the biggest and first step. There are also things like content security policy or other response headers that can help add layers of protection. I talk about a few of these options in my new course “Security Fundamentals for Application Teams“. Remember that understanding your framework is critical in helping reduce security risks in your application. If you are making the switch to .Net core, keep in mind that not all the features you may be used to exist. Understand these changes so you don’t get bit. It is not news that SQL Injection is possible within a stored procedure. There have been plenty of articles discussing this issues. However, there is a unique way that some developers execute their stored procedures that make them vulnerable to SQL Injection, even when the stored procedure itself is actually safe. Look at the example below. The code is using a stored procedure, but it is calling the stored procedure using a dynamic statement. It doesn’t really matter what is in the stored procedure for this particular example. This is because the stored procedure is not where the injection is going to occur. Instead, the injection occurs when the EXEC statement is concatenated together. The email parameter is being dynamically added in, which we know is bad. System.Data.SqlClient.SqlException (0x80131904): Procedure or function spGetData has too many arguments specified. at System.Data.SqlClient.SqlConnection. The mention of the stored procedure having too many arguments helps identify this technique for calling stored procedures. With SQL we have the ability to execute more than one query in a given transaction. In this case, we just need to break out of the current exec statement and add our own statement. Remember, this doesn’t effect the execution of the spGetData stored procedure. We are looking at the ability to add new statements to the request. The above query will execute the spGetData stored procedure and then execute the following SELECT statement, ultimately returning 2 result sets. In many cases, this is not that useful for an attacker because the second table would not be returned to the user. However, this doesn’t mean that this makes an attack impossible. Instead, this turns our attacks more towards what we can Do, not what can we receive. If the user has permissions, the server would drop tblUsers, causing a lot of problems. The code above adds parameters to the command object, removing the ability to inject into the dynamic code. It is easy to think that because it is a stored procedure, and the stored procedure may be safe, that we are secure. Unfortunately, simple mistakes like this can lead to a vulnerability. Make sure that you are properly making database calls using parameterized queries. Don’t use dynamic SQL, even if it is to call a stored procedure. XXE, or XML External Entity, is an attack against applications that parse XML. It occurs when XML input contains a reference to an external entity that it wasn’t expected to have access to. Through this article, I will discuss how .Net handles XML for certain objects and how to properly configure these objects to block XXE attacks. It is important to understand that the different versions of the .Net framework handle this differently. I will point out the differences for each object. The ProhibitDtd property is used to determine if a DTD will be parsed. 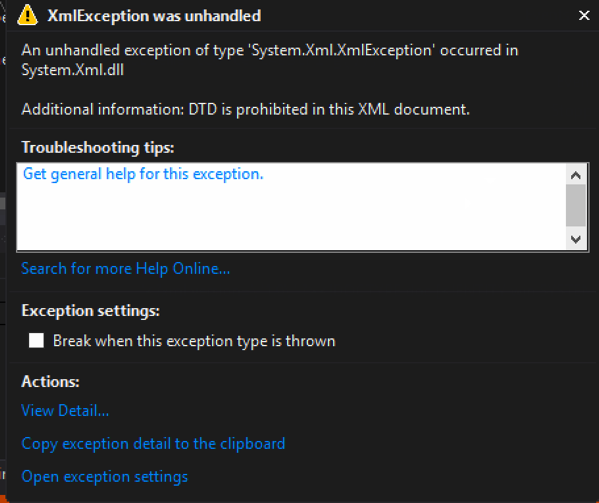 Code that throws an exception when a DTD is processed: – By default, ProhibitDtd is set to true and will throw an exception when an Entity is referenced. Code that allows a DTD to be processed: – Using the XmlReaderSettings object, it is possible to allow the parsing of the entity. This could make your application vulnerable to XXE. 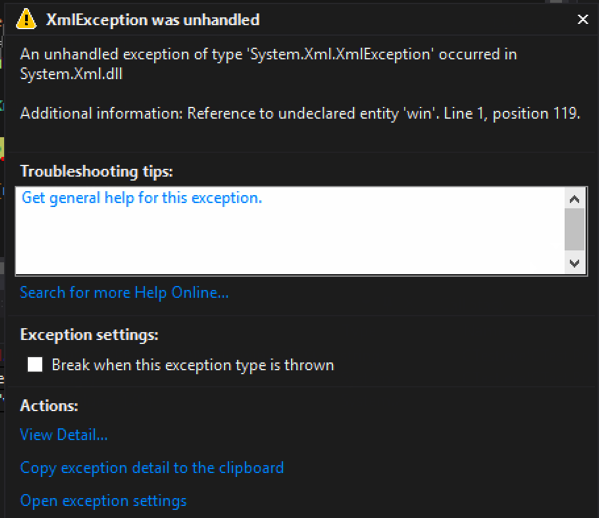 Prohibit (default) – Throws an exception if a DTD is identified. Ignore – Ignores any DTD specifications in the document, skipping over them and continues processing the document. Code that throws an exception when a DTD is processed: – By default, the DtdProcessing is set to Prohibit, blocking any external entities and creating safe code. Code that ignores DTDs and continues processing: – Using the XmlReaderSettings object, setting DtdProcessing to Ignore will skip processing any entities. In this case, it threw an exception because there was a reference to the entirety that was skipped. Code that allows a DTD to be processed: Using the XmlReaderSettings object, setting DtdProcessing to Parse will allow processing the entities. This potentially makes your code vulnerable. The XmlTextReader uses the same properties as the XmlReader object, however there is one big difference. The XmlTextReader defaults to parsing XML Entities so you need to explicitly tell it not too. Code that allows a Dtd to be processed: (Potentially Vulnerable) – By default, the XMLTextReader sets the ProhibitDtd property to False, allowing entities to be parsed and the code to potentially be vulnerable. Code that blocks the Dtd from being parsed and throws an exception: – Setting the ProhibitDtd property to true (explicitly) will block Dtds from being processed making the code safe from XXE. Notice how the XmlTextReader has the ProhibitDtd property directly, it doesn’t have to use the XmlReaderSettings object. Prohibit – Throws an exception if a DTD is identified. Code that allows a DTD to be processed: (Vulnerable) – By default, the XMLTextReader sets the DtdProcessing to Parse, making the code potentially vulnerable to XXE. Code that blocks the Dtd from being parsed: – To block entities from being parsed, you must explicitly set the DtdProcessing property to Prohibit or Ignore. 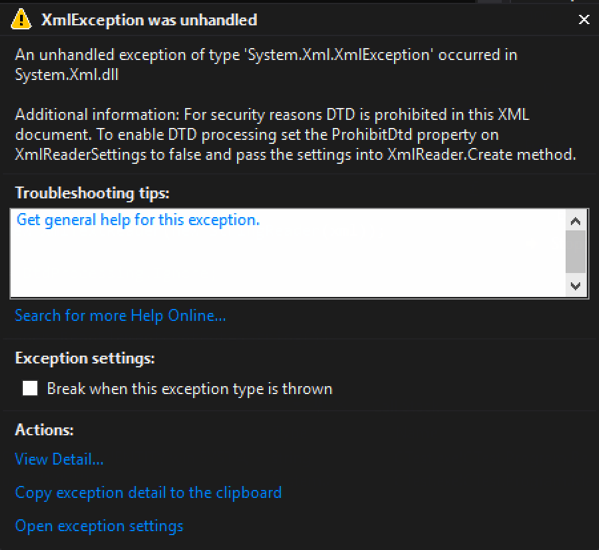 Note that this is set directly on the XmlTextReader and not through the XmlReaderSettings object. For the XMLDocument, you need to change the default XMLResolver object to prohibit a Dtd from being parsed. By default, the XMLDocument sets the URLResolver which will parse Dtds included in the XML document. To prohibit this, set the XmlResolver = null. Code that does not set the XmlResolver properly (potentially vulnerable) – The default XMLResolver will parse entities, making the following code potentially vulnerable. 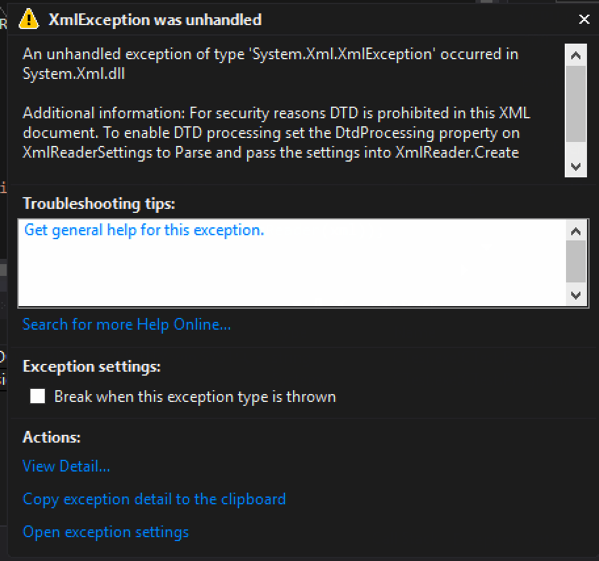 Code that does set the XmlResolver to null, blocking any Dtds from executing: – To block entities from being parsed, you must explicitly set the XmlResolver to null. This example uses LoadXml instead of Load, but they both work the same in this case. It appears that in .Net 4.6, the XMLResolver is defaulted to Null, making the XmlDocument safe. However, you can still set the XmlResolver in a similar way as prior to 4.6 (see previous code snippet). I was recently looking through some code and happen to stumble across some logic that is attempting to prohibit the application from redirecting to an external site. While this sounds like a pretty simple task, it is common to see it incorrectly implemented. Lets look at the check that is being performed. The first thing I noticed was the line that checks to see if the url starts with a “/” characters. This is a common mistake when developers try to stop open redirection. The assumption is that to redirect to an external site one would need the protocol. For example, http://www.developsec.com. By forcing the url to start with the “/” character it is impossible to get the “http:” in there. Unfortunately, it is also possible to use //www.developsec.com as the url and it will also be interpreted as an absolute url. In the example above, by passing in returnUrl=//www.developsec.com the code will see the starting “/” character and allow the redirect. The browser would interpret the “//” as absolute and navigate to www.developsec.com. After putting a quick test case together, I quickly proved out the point and was successful in bypassing this logic to enable a redirect to external sites. ASP.Net has build in procedures for determining if a path is relative or absolute. The following code shows one way of doing this. In the above example, if the URL is absolute (starts with a protocol, http/https, or starts with “//”) it will just redirect to the default page. If the url is not absolute, but relative, it will redirect to the url passed in. When using the above logic, it flagged //www.developsec.com as a relative path which would not be what we are looking for. The previous logic correctly identified this as an absolute url. There may be other methods of doing this and MVC provides some other functions as well that we will cover in a different post. Make sure that you have a solid understanding of the problem and the different ways it works. It is easy to overlook some of these different techniques. There is a lot to learn, and we should be learning every day. When it comes to automated testing for applications there are two main types: Dynamic and Static. Dynamic scanning is where the scanner is analyzing the application in a running state. This method doesn’t have access to the source code or the binary itself, but is able to see how things function during runtime. Static analysis is where the scanner is looking at the source code or the binary output of the application. While this type of analysis doesn’t see the code as it is running, it has the ability to trace how data flows the the application down to the function level. An important component to any secure development workflow, dynamic scanning analyzes a system as it is running. Before the application is running the focus is shifted to the source code which is where static analysis fits in. At this state it is possible to identify many common vulnerabilities while integrating into your build processes. If you are thinking about adding static analysis to your process there are a few things to think about. Keep in mind there is not just one factor that should be the decision maker. Budget, in-house experience, application type and other factors will combine to make the right decision. Disclaimer: I don’t endorse any products I talk about here. I do have direct experience with the ones I mention and that is why they are mentioned. I prefer not to speak to those products I have never used. I hate to list this first, but honestly it is a pretty big factor in your implementation of static analysis. The vast options that exist for static analysis range from FREE to VERY EXPENSIVE. It is good to have an idea of what type of budget you have at hand to better understand what option may be right. There are a few free tools out there that may work for your situation. Most of these tools depend on the programming language you use, unlike many of the commercial tools that support many of the common languages. For .Net developers, CAT.Net is the first static analysis tool that comes to mind. The downside is that it has not been updated in a long time. While it may still help a little, it will not compare to many of the commercial tools that are available. In the Ruby world, I have used Brakeman which worked fairly well. You may find you have to do a little fiddling to get it up and running properly, but if you are a Ruby developer then this may be a simple task. Can you manage a scanner in-house or is this something better delegated to a third party that specializes in the technology? Choosing to go with a managed solution works well for many companies. Whether it is because the development team is small, resources aren’t available or budget, using a 3rd party may be the right solution. There is always the question as to whether or not you are ok with sending your code to a 3rd party or not, but many are ok with this to get the solution they need. Many of the managed services have the additional benefit of reducing false positives in the results. This can be one of the most time consuming pieces of a static analysis tool, right there with getting it set up and configured properly. Some scans may return upwards of 10’s of thousands of results. Weeding through all of those can be very time consuming and have a negative effect on the poor person stuck doing it. Having a company manage that portion can be very beneficial and cost effective. Picking the right static analysis solution is important, but can be difficult. Take the time to determine what your end goal is when implementing static analysis. Are you looking for something that is good, but not customizable to your environment, or something that is highly extensible and integrated closely with your workflow? Unfortunately, sometimes our budget may limit what we can do, but we have to start someplace. Take the time to talk to other people that have used the solutions you are looking at. Has their experience been good? What did/do they like? What don’t they like? Remember that static analysis is not the complete solution, but rather a component of a solution. Dropping this into your workflow won’t make you secure, but it will help decrease the attack surface area if implemented properly.